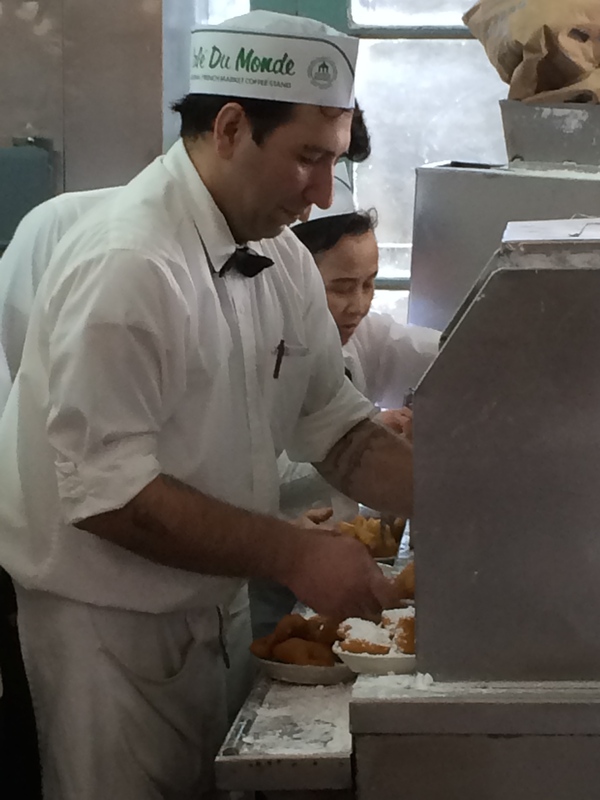 Behind the scenes: Cafe Du Monde, New Orleans | Oh, the Places We See . . . 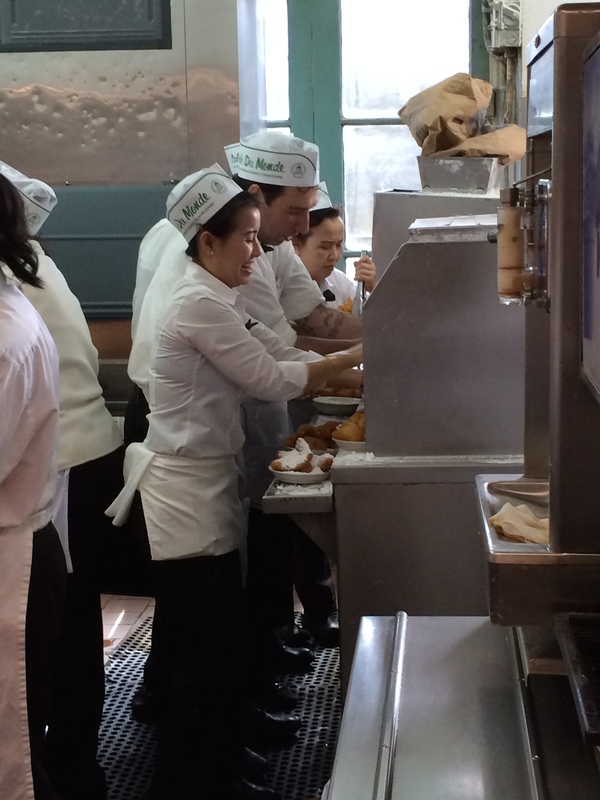 The heartbeat of Cafe Du Monde — waitresses who serve what you came for! As iconic as the Café Du Monde in New Orleans is for us and other tourists, it presented something new this trip: a trip to the back of the restaurant to see “how it’s done”! No visit to NOLA is complete for us without a stop at 800 Decatur Street. It’s where the Original Café Du Monde Coffee Stand has stood since 1862, and where patient waiters and waitresses continue to please a steady stream of folks ordering cafe au lait and beignets. Morning shift — Cafe Du Monde, New Orleans French Quarter. Open 24 hours a day (except for Christmas Day and the occasional hurricane), Café Du Monde is a well-oiled institution dishing up white ceramic mugs of their famous coffee and chicory blend mixed half-and-half with hot milk — rich, creamy coffee au lait! But don’t wear black at Café Du Monde — you’re gonna want to indulge in a three-stack of beignets, those square French doughnuts liberally coated in white powdered sugar. Rich, milk-infused cafe au lait and sugary beignets at Cafe Du Monde. The experience begins with a patient, very patient, waiter or waitress taking your order. Listening carefully to what you want at Cafe Du Monde. And then they kick it into gear, waiting in line for trays, mugs, and saucers of beignets. Lining up for trays and mugs at Cafe Du Monde. And wait some more. Until fresh ones come from the back served up on tiny saucers. Will the beignets ever get done? Peeking in through the back window at Cafe du Monde. Feverishly, almost sportingly, the wait staff move in. Hey, that’s mine. Wait a minute! Hold up! I’ve got that one! Last stop: big urns for straight-up black coffee or cafe au lait. Calmly, as if scurrying would be beneath the dignity of a Café Du Monde server, waiters return to their tables without spilling any of their now-famous Acadian blend of coffee and chicory and sure-to-please beignets. It’s what you don’t want to miss in New Orleans. Whether you’re right out front — or behind the scenes! Cafe Du Monde, 800 Decatur Street, New Orleans, LA; cafedumonde.com; Mail Order: 1-800-772-2927. Check out all our posts on Travel Series: New Orleans here. This entry was posted in Food, Louisiana, New Orleans, Restaurant, Travel and tagged beignets, cafe au lait, Cafe du Monde, New Orleans. Bookmark the permalink. Oh my God, the beignets look simply delicious! Just like in the movie, the princess and the frog 😀 I developed an urge to visit New Orleans after watching it, heading directly to that café when I get there! It’s definitely one of the places that tourists want to see. I wish I had tips on a best time to go, but it’s almost always busy any time of day or night. Just remember: Don’t wear black! Powdered sugar is everywhere. Although we didn’t see any billows of sugar wafting through the air, there was film of it on tables, chairs, and us. Oh, well. Part of the charm. Would do it again, too! I went there once. I think I ate a salad for lunch. That was definitely the wrong thing to eat!! Well, you may want to incorporate something we say all the time into your well-used statements: “Just have to go back, I guess!” There’s always next time, I guess. And I have lots of places I’d like to “do over”! Thanks so much. It’s easy to write about a place we love. Since we spent our honeymoon in NOLA almost 49 years ago and have returned often since then, we know not to wear black there. We always get sugar on us! Thanks for your lovely comments. Wow, almost 49 years!? Congrats to you both! I’m hungry just writing about this place!!! And we’ve eaten beignets at other places — all good, by the way. But there’s just something about going back to where it all began! Thanks for reminding me that coffee & beignets is an antidote to good times in NOLA!